Lip Monthly is a Monthly subscription that any Lip Fanatic would want to try out! Let's all just say when it comes to Lip Products I am always the first one swatching and testing the products out. I have to admit I had heard of Lip Monthly before and have been watching some YouTube unboxing and reviews just to see if it's worth the hype. I have seen some received a sample of an Ofra Liquid Lipstick, Many Full Sized Products and even some multiple products which can be used on the lip and cheeks. I have the August 2016 Bag which I received about just under two weeks ago. And have also filmed a YouTube Review which you can view below at the end of this post. I am not going to go intotoo much detail as I have already done so in the video but I know many of you prefer the written text so I am doing my up most to provide this for you. Lip Monthly is $12.95* per month and can be purchased from their website www.lipmonthly.com and they also have 3 bundles to choose from, one month purchase, 4 months and even an annual purchase. The best thing is that they also have promo codes to get some $$$ off which we cannot complain about. This Month's bag I received 4 Full Sized Products with a total value of $69. I think for the price and FREE Worldwide Shipping and no customs charges, I was very happy with the contents. The Lipliner is a gorgeous Mauve pink very similar to MAC's Soar Lipliner and the Lip Gel dries matte like a liquid lipstick! Next we have the Lip and Cheek Shimmery Stick which in my opinion I wouldnt use on my lips as it's too shimmer for me and slightly too dark as a highlight - the only thing I did think about is using it as a cream eyeshadow. Last product is a satin matte chubby stick pencil and is a gorgeous summery coral shade. I will probably try and use it before Fall kicks in as I tend to go for those darker shades once fall kicks in. I have the swatches below which I show in the video. Overall, I'm impressed with this little subscription bag, and I'm thinking of subscribing for 4 months to test it's waters and see if it's worth it. 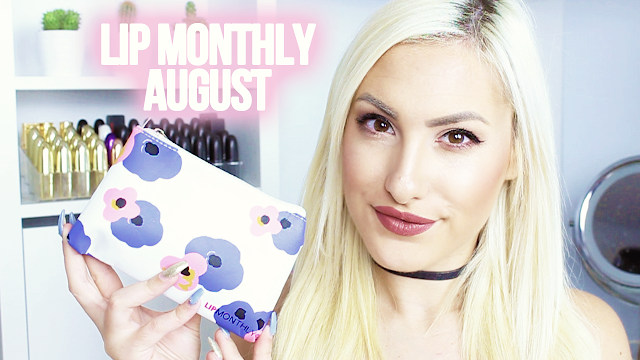 I'm curious to see if the products are different each month and also what kind of products are sent each month. Have a look at my Youtube review below and thanks for reading this lengthy post! YouTube Video Review - Lip Monthly August 2016.